As a child, I was a sucker for Amelia Bedelia author Peggy Parish's tales of mystery and youthful treasure hunting found in the Lisa*, Bill, and Jed series via books like Keys to the Treasure which managed to blend excitement with history and adventure. And while as an adult, I'm not quite as up on my children's literature since film is my line of knowledge-- nonetheless, it's a bit worrying to discover the very slim range of worthwhile titles offered for adolescents since instead they seem as though they're divided strictly down the gender lines. However and perhaps in a nice way to balance out this mess, it's been truly refreshing to see the worthwhile adaptations of young adult prize winners and favorites such as Holes, Nancy Drew, and Kit Kittredge make their way to the big screen. Likewise, thanks to organizations such as the Kids First! Film and Video Festival, Dove's Seal of Family Approval and the Heartland's Truly Moving Pictures Awards having become the cinematic equivalent of Lisa, Bill, and Jed's Keys to the Treasure, awareness of overlooked family gems is growing more and more everyday. Despite this, sadly, it's often hard to actually locate the titles since they're usually independent or lower-budget.Moreover, the off-the-beaten path works that sneak onto shelves usually aren't given the same great marketing push of say, the latest family feature extravaganza from a major studio with Happy Meal tie-ins and action figures. Determined not to let these works get overlooked, I eagerly tackle as many films as I can and a few weeks back, Paramount released a small gem of a film called A Plumm Summer which-- initially derived from a true story-- took a nostalgic view of coming-of-age in the 1960's as a few kids band together to solve the mystery of a missing beloved marionette from the number one rated television show in the area. A sweet charmer of a movie that nonetheless managed to work in some mature plot-points as well-- the film which came highly recommended here at Film Intuition-- makes an ideal double feature or companion piece to this great new family release from writer/director Greg Aronowitz. While Plumm's target demographic perhaps skewed a few years older and didn't take a gentle fantasy approach, longtime special effects, prop-maker, and art department veteran Aronowitz (who worked on everything from Spielberg's Minority Report and A.I. 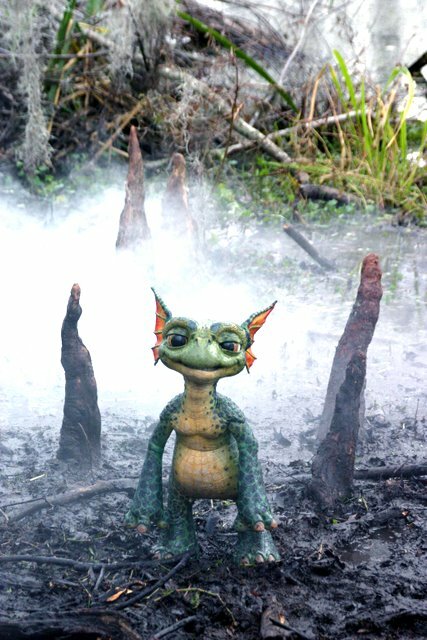 to the family hits The Country Bears, The Haunted Mansion, and Scooby Doo 2: Monsters Unleashed) utilizes his years of art experience for his first feature length film, Labou. An official selection of the Kids First! Film and Video Festival that additionally earned the "Best of the Fest" award from Chicago International Children's Film Festival, and "Best Feature" at New York's 10th Annual Brooklyn Academy of Music Kids Film Festival as well as Dove's "Family Approved" seal opens with a fantastical prologue that sets the stage for this atmospheric, jazz-infused ghost pirate adventure set in the New Orleans swamplands. 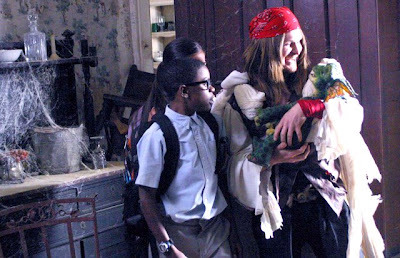 As the school's over-confident "bully" the Toddster (Bryan James Kitto) chronicles the legend about the Ghost of Captain LeRouge who haunts the Bayou looking for his sunken ship filled with lost treasure, two of his schoolmates shake him out of his reverie. When Marissa Cuevas' cute and practical Emily Ryan and the school's newest student-- the precocious, overly sheltered, brainy nerd Gavin Thompson (Darnell J. Hamilton)-- demand proof for the Toddster's yarn, the three kids set off on a hunt for not just the ghost but his buried treasure as well. After Emily realizes that two shady cowboy oil men have shown up in town with the intent to travel in the exact direction they're headed, she thinks quickly and steals the map from the public library, promising the boys she'll return it once they've found the treasure. Of course, she makes this pledge right before tearing the map into three parts and handing off a section to both of her partners in adventurous crime yet once they head out to the swamplands, the trio soon encounter more than they bargained for when they come face-to-face with a rather rhythmic adorable, puppy-eyed "mud monkey" also known as Labou. Drawn in by the sound of Toddster's harmonica and Gavin's cellular phone, soon the kids and Labou engage in an improvised Louisiana swampland jam session before uncovering that the whistles of their new green pal have been said to have served as the impetus for the genre of jazz. Given Aronowitz's extremely impressive background working in all areas of behind-the-scenes movie-making, the film looks and sounds gorgeous with enviable special effects in crafting not just Labou but the pirate ghosts and other bits of trickery that crop up when the children-- who by now realize they must start to overcome their differences-- join forces to stop the real enemy in the form of the oil tycoons who want to destroy Louisiana's swamplands, Labou's race of creatures, and Earth's natural resources in the name of oil, greed, money and pollution. Although predictably, our villains are beyond incompetent and don't pose a major threat to the children as in a typical case, after Toddster is compromised, one threatens to tell the kids at his school that he signed up for ballet and the film's conclusion really spells out the morals of the movie and lessons of friendship-- it's a beautifully filmed, positive, and spirited little sleeper. Managing to capture the flavor of New Orleans especially in the form of its rich natural colors and the sounds of jazz musicians on the street-- the release of the new DVD from Metro-Goldwyn-Mayer also ensures that children learn more about the swamplands and surroundings of the fictitious adventures in a series of fun and informative DVD extras (some of which are more geared towards film lovers than children). 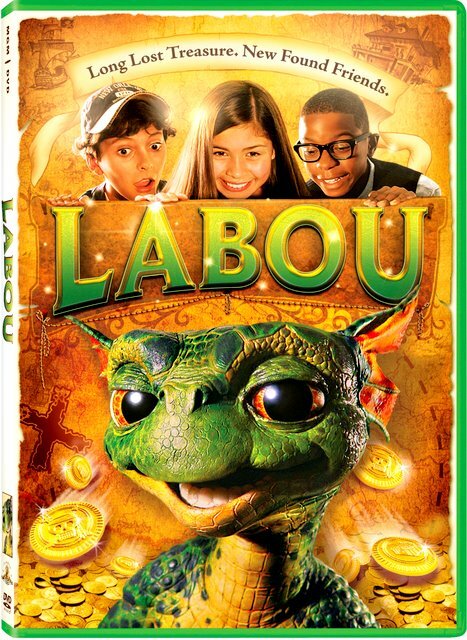 A crowd favorite throughout its limited festival engagement, Labou made its premiere on DVD on the same day as its fellow studio child-friendly work in the form of Fox's Dr. Dolittle: Million Dollar Mutts. And while I can't yet speak for Mutts as I haven't reviewed it-- all I can say is that much like the underrated Plumm Summer, for children ages seven and up, this lively and solidly made family effort is well-worth tracking down. Overall, it's a salute to children's imagination and the valuable lesson that working together can lead to better success. Likewise and much like Slumdog Millionaire director Danny Boyle's Millions-- the underlying theme of trying to do what's right when faced with the prospect of treasure, Labou is a sure-fire way to kick off summer vacation for youngsters longing to create their very own treasure hunts whether in their imagination, backyards, or in the Louisianian swamplands with the Toddster, Emily, and Gavin. * or Liza, Bill, and Jed depending on the website since Parish's works are credited with Lisa, Bill, and Jed as well as Liza, Bill, and Jed.